If July is when you earn your scholarship offers then August is when you act on them. Recruits have been flying off the board left and right for the month or so and Michigan’s board has definitely been affected. 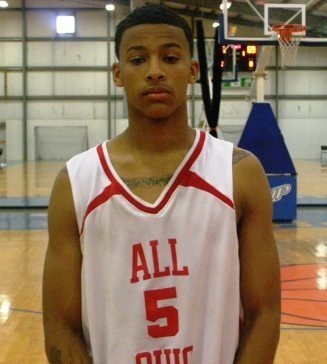 Michigan scored a commitment of their own in Columbus Northland point guard Trey Burke. With Burke’s commitment, the recruiting plan for the next two classes has become slightly more clear. Trey Burke wasn’t on our pre-July hot board and a number of players that were have either committed elsewhere or trimmed their lists to eliminate Michigan. We’ll have hotboard updates soon but for now here’s a quick run through of where things stand. With Burke’s commitment, on paper, Michigan has one additional scholarship to give in the class of 2011 and two to give in the class of 2012. Given that the 2011 class consists of two 6-foot-ish guards in Carlton Brundidge and Trey Burke, it is very unlikely that Michigan would take another small guard in the class. Many expect that Michigan is pigeonholed into taking a big in the 2011 class but I don’t think that’s the case — considering there are four players 6-foot-9 or taller with freshmen eligibility this year. At this point it seems like they would be best served taking the best available player — wing or big man. The direction Michigan goes in the class of 2012 obviously depends on how the 2011 class wraps up. Judging by the sheer quantity of wings on Michigan’s radar, it’s tough to imagine them not taking at least one. With few big men targets remaining in the class of 2011, it would probably make more sense to wait until 2012 where plenty of bigs have yet to emerge. Here’s a list of known targets in the class of 2011 and 2012 with some loose prioritization. 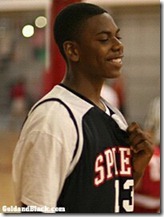 Dominique Pointer (2011, 6-5, G/F, QEA/The Family) – OFFER – Video – Pointer is an athlete in every sense of the word. There are question marks about the rest of his game, mostly because the only video we see is of him terrorizing other kids with his dunks. 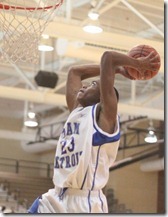 Michigan has offered Pointer and are in his top three along with West Virginia and St. Johns. Pointer plans to decide by the November signing period and is clearly a priority for Michigan. 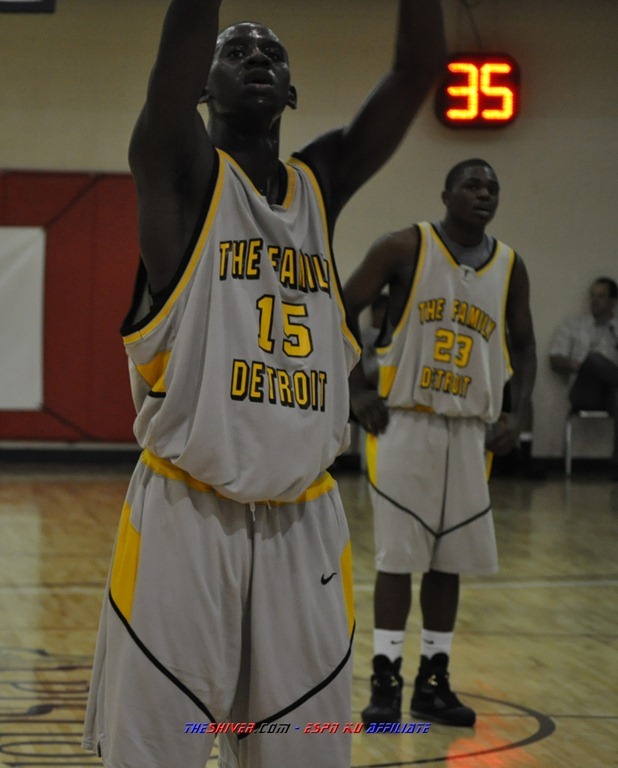 Amir Williams (2011, 6-11, C, Country Day/The Family) – OFFER – Amir is one of the most talented players in the state of Michigan but he has kept things relatively quiet regarding his recruitment. He’s in no hurry to make a decision but will likely trim his list before school starts. Michigan should make the cut but many have Williams pegged to go out of state. Kevin Pangos (2011/2012, 6-3, PG, Canada) – OFFER – Pangos is now leaning toward the class of 2011 which means that chances are he won’t end up in Ann Arbor – there’s just not room for another short guard in this class. Two names that have been on the radar won’t be coming to Michigan. Pat Ackerman committed to Penn State over the weekend and Trey McDonald trimmed his list to six schools: CMU, Oakland, West Virginia, Marqutte, DePaul, and Wake Forest. More updates on 2012 prospects after the break. 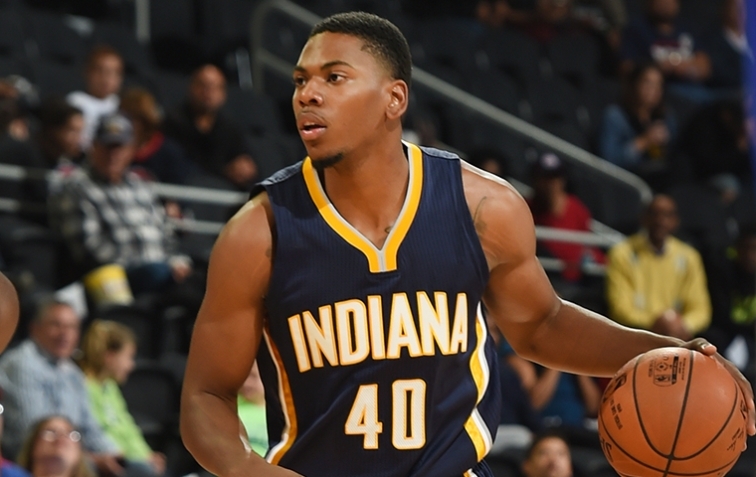 Gary Harris, Javontae Hawkins, and Glenn Robinson III all hold Michigan offers. 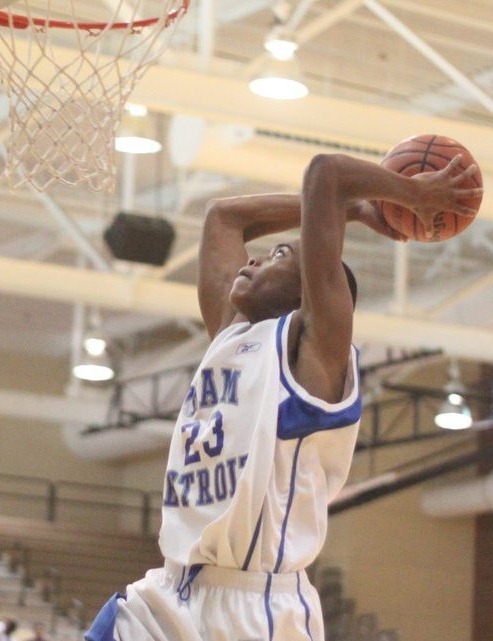 Javontae Hawkins (2012, 6-4, G/F, Flint Powers/Team Detroit) – OFFER – Michigan has been all over Hawkins for a long time and they are continuing to push. Hawkins has been to Ann Arbor several times, most recently for the UConn game, and has previously named Michigan his leader. 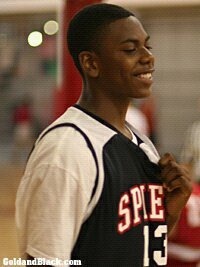 Glenn Robinson III (2012, 6-5, WF, Lake Central/SYF) – OFFER – Robinson isn’t at his dad’s level but he played well enough this summer to earn a Michigan offer. Robinson made it to Ann Arbor for the UConn game, his third trip to Ann Arbor this summer. Mutual interest is obviously very high here and it will be interesting to see if things accelerate. 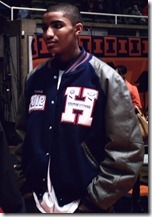 Gary Harris (2012, 6-4, G/F, Hamilton SE/D3 Heat) – OFFER – Harris emerged as one of the top players in the class of 2012 this summer – ranked by Scout and Rivals as a top 20 player nationally. MSU, Notre Dame, Indiana, Illinois, Xavier, and Ohio State are among the other programs hot and heavy after Harris. Harris was expected in Ann Arbor for the UConn game last weekend but didn’t make it. Nick Stauskas (2012, 6-5, G/F, Canada) – Stauskas is another wing but his game is much different than Hawkins’. Hawkins is the high flyer while Stauskas is more of a skilled scorer. Last we checked Stauskas didn’t have a Michigan offer but that could certainly change. Very high mutual interest. Sherron Dorsey-Walker (2012, 6-4, WG, Detroit Pershing/REACH) – Another wing guard prospect on the radar. Dorsey can shoot it and really play, he’s been rising up the recruiting charts and has several high major offers. Beilein is expected to be at Dorsey-Walker’s open gym Thursday – will an offer follow? Video and interview here. 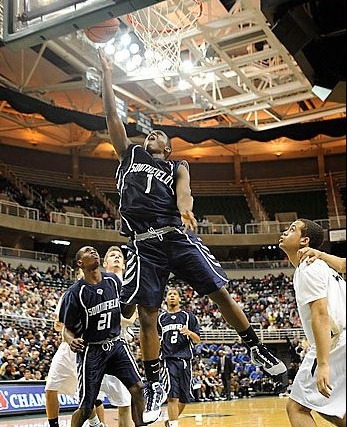 Kevin “Yogi” Ferrell (2012, 5-11, PG, Park Tudor/Indiana Elite) – OFFER – Michigan has been heavily recruiting Ferrell since he put on a clinic at Michigan’s Elite Camp back in 2009. Now the point guard has blown up on the national stage and is ranked among the top 5 PGs in the country. The competition is stiff and with Michigan taking Trey Burke in the class of 2011, the likelihood of Ferrell wearing Maize and Blue probably has decreased. These are in no particular order and being listed here doesn’t necessarily speak to their priority on Michigan’s radar. It mostly means that we don’t have much to update on their recruitments at this time.